Summer is (finally) here, and it’s time to start training for your fall event. There are more options to help you prepare then ever before, from groups to one-on-one coaching. How do you know which one is right for you? Below is a description of each type of training program or plan, as well as a few tips to help you find the right match. We’ve even included tips from one of our expert coaches to help you find the right program to help you reach your goals. Typically downloaded from the Internet, this is a “nuts & bolts” plan that includes the basic workouts you need to reach the finish line. Complexity varies greatly, and you can find anything from a basic beginner plan with mileage only, to an advanced workout plan with every workout type you could imagine. It is important to realize that a generic plan is created for the “average” runner in any given category, and choose carefully to ensure you won’t be over or under-training. Who it’s best for: Many runners start with a generic plan, and it is a typically a free option that can help you reach the finish line if you don’t need a lot of support or personalization. Typically created by a coach, a custom plan is designed to fit your training schedule, personal goals and running history. It should be created based on scientific progressions, including recovery time as well as quality workouts. If you’re purchasing a custom plan, look for one offered by a certified coach who has experience coaching at the distance you are training for. Some custom plans even come with an initial consultation where your coach can get to know you better before designing your program. Who it’s best for: Custom plans are ideal for self-motivated runners who want a detailed plan fit to their schedule. It works best if your life schedule is fairly predictable, so you don’t need to make many changes week-to-week. Custom plans are typically a great value, where you get a program created just for you for less than you would pay for ongoing coaching. 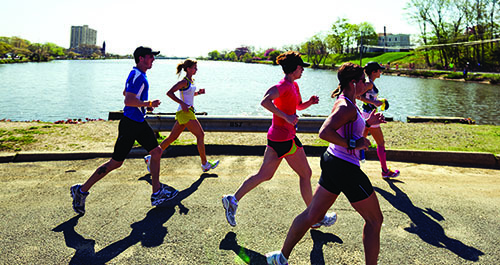 A group program that is generally designed to prepare runners for a specific event. Groups typically have multiple pace & ability groups, following training plans designed by pace group. Quality programs also include educational seminars, fun socials as well as regular email communications from your coach with workout details and training tips. Who it’s best for: Group Training can benefit everyone, but is perfect for runners looking to be challenged by a group, or those who want running buddies to make the miles seem to pass more quickly. Check the group schedule to see that it fits into your summer work & travel schedule. Personal coaching to help you reach your goals. Your coach will write your custom training plan, and update it following regular email and/or phone communication. Most 1:1 coaching programs are over the phone with workouts delivered either via email or an online training tool. Look for a certified coach who can motivate you while providing education and a quality plan for you to follow. Who it’s best for: 1:1 Coaching is great for runners who need a flexible schedule and want to get the most out of their running time. It is perfect for beginners who want a mentor to help them get started on the right foot, as well as experienced runners who want cutting-edge information and a program to help them improve their PR.